Ahead of the Saturday 9th governorship polls, the opposition People’s Democratic Party (PDP) in‎ Bauchi state has alleged that the ruling All Progressives Congress (APC) ‎has perfected plans to arrest its gubernatorial candidate, Senator Bala Mohammed. The allegation was made on Thursday by the party’s state chairman, Alhaji Hamza Koshe Akuyam while addressing a press conference at the Secretariat of Nigeria Union of Journalists in ‎Bauchi. 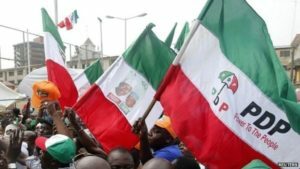 The Chairman of the party said that the planned arrest of its flag bearer ‎the security agents was to intimidate him and his supporters ahead of the governorship and House of Assembly elections on Saturday. He further alleged that the plan is being hatched by the state governor, ‎Mohammed Abubakar together with the Independent National Electoral Commission’s Resident Electoral Commissioner in the state. Akuyam disclosed that several PDP ‎supporters have been arbitrarily arrested by the state government ahead of the coming election. arrested PDP supporters until after the elections to weaken the chances of the main opposition party at the polls. The opposition Peoples Democratic Party ( PDP), disclosed that there is also a plan to delay the distribution of election materials for the governorship and House of Assembly on Saturday. Akuyam also said that INEC was planning to supply inadequate election materials in the strongholds of the opposition Peoples Democratic Party to mitigate their chances of winning the election. 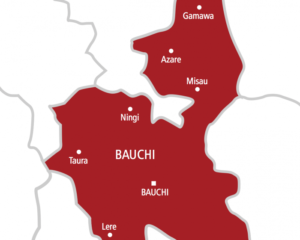 The PDP also alleged plans by the Bauchi State governor, Mohammed Abubakar in collaboration with the Independent National Electoral Commission (INEC) to postpone Saturday’s Governorship and State Assembly election in the state. He called on the ‎National headquarters of the electoral body to closely monitor the situation of things in Bauchi in order ‎to tackle any plans of manipulating the elections. ‎In reaction, the Head of Department, Voter Education and Publicity, Ahmed Waziri debunked any plan of postponing election as according to him, for such to happen, there must be a basis. ‎Adding that, “the ballot papers are customized so you can’t take one to another place. Therefore, the issue of postponement does not even arise”‎. Akuyam also alleged that Governor Abubakar has also mobilized thugs to harass voters and cause mayhem to disrupt the election. But the Press Secretary to the state governor, Abubakar Al-Sadique in a swift response to the allegations said that the Governor does not need to arrest any member of the opposition to win election. He said that, “we are peace-loving administration and do not need to arrest anybody before the good people of Bauchi vote for His Excellency, Barrister Mohammed Abdullahi Abubakar to renew his mandate come Saturday”. Al-Sadique however said that the allegation of plan to arrest the PDP candidate is nothing but false and baseless.